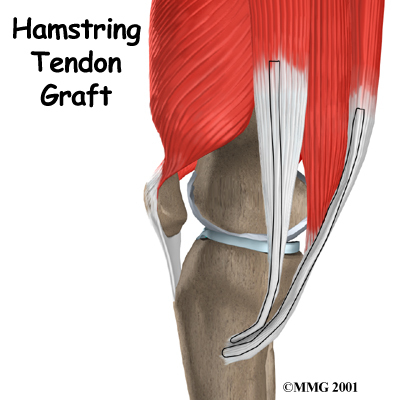 Welcome to Purposed Physical Therapy's patient resource about Hamstring Tendon Graft Reconstruction of the ACL. 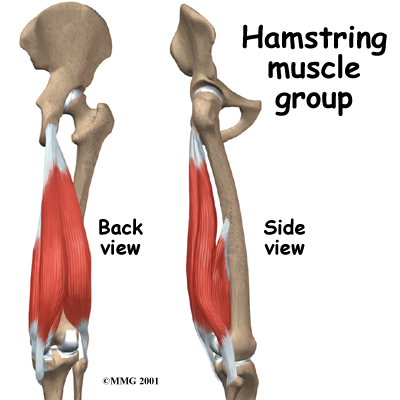 The hamstring muscles run down the back of the thigh. Their tendons cross the knee joint and connect on each side of the tibia. 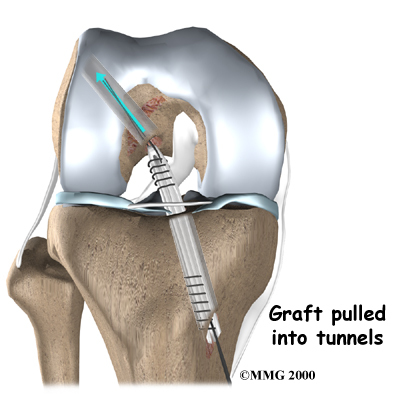 The graft used in ACL reconstruction is taken from the hamstring tendon (semitendinosus) along the inside part of the thigh and knee. 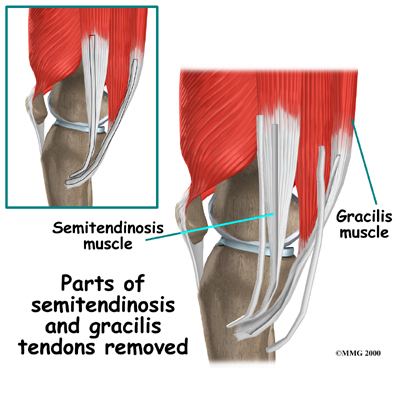 Surgeons also commonly include a tendon just next to the semitendinousus, called the gracilis. 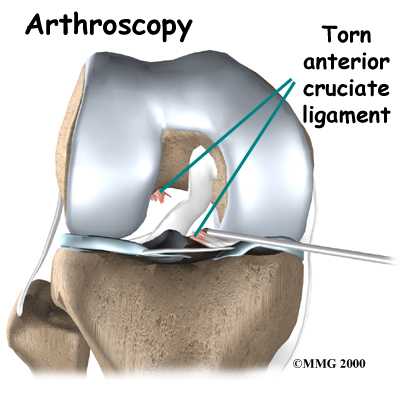 Most surgeons perform this surgery using an arthroscope, a small fiber-optic TV camera that is used to see and operate inside the joint. Only small incisions are needed during arthroscopy for this procedure. 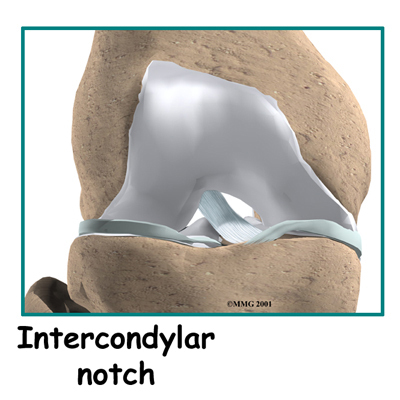 The surgery doesn't require the surgeon to open the knee joint. 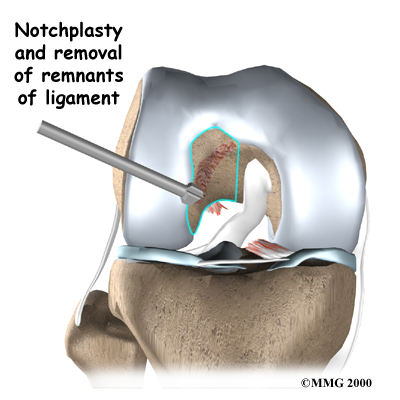 An incision is also made along the inside edge of the knee, just over where the hamstring tendons attach to the tibia. Working through this incision, the surgeon takes out the semitendinosus and gracilis tendons. 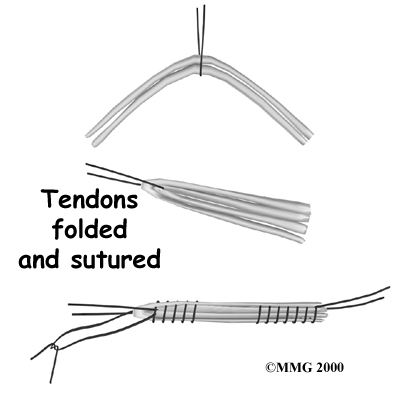 Some surgeons prefer to use only the semitendinosus tendon and do not disrupt the gracilis tendon. The tendons are arranged into three or four strips, which increases the strength of the graft. The surgeon stiches the strips together to hold them in place. The graft is then pulled into position through the drill holes. Screws or staples are used to hold the graft inside the drill holes. 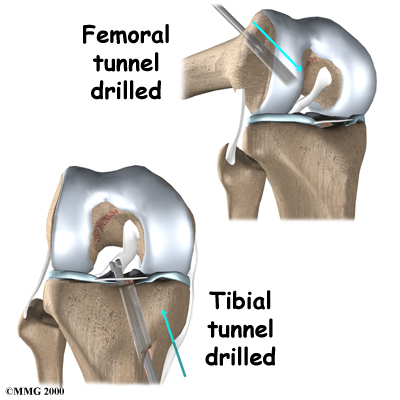 To keep fluid from building up in your knee, the surgeon may place a tube in your knee joint. The portals and skin incisions are then stitched together, completing the surgery. The main function of the hamstrings is to bend the knee (knee flexion). 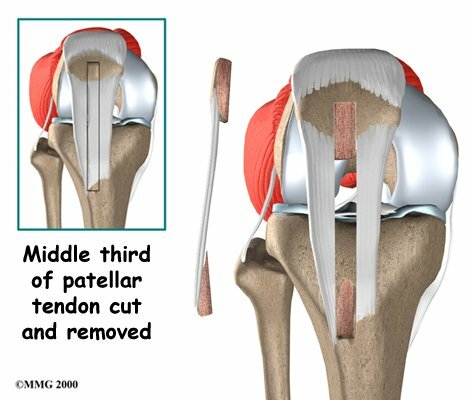 This motion may be slightly weaker in people who have had a hamstring tendon graft to reconstruct a torn ACL. Some studies, however, indicate that overall strength is not lost because the rest of the hamstring muscle takes over for the weakened area. Even the portion of muscle where the tendon was removed works harder to make up for the loss. The hamstring muscles sometimes atrophy (shrink) near the spot where the tendon was removed. 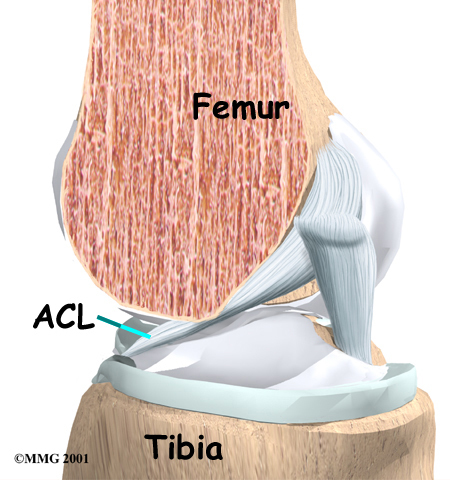 This may explain why some studies find weakness when the hamstring muscles are tested after this kind of ACL repair. 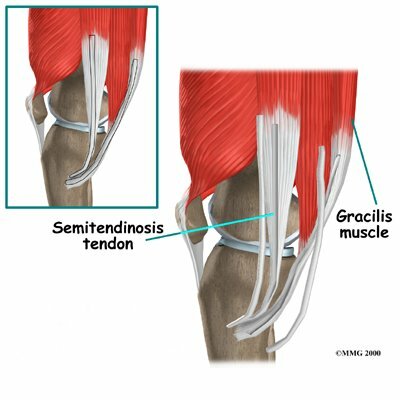 However, the changes seem to mainly occur if both the semitendinosus and gracilis tendons were used. And the weakness is mostly noticed by athletes involved in sports that require deep knee bending. This may include participants in judo, wrestling, and gymnastics. These athletes may want to choose a different method of repair for ACL tears. The Physical Therapist will choose treatments to get the thigh muscles toned and active again. Patients are cautioned about overworking their hamstrings in the first six weeks after surgery. They are often shown how to do isometric exercises for the hamstrings. Isometrics work the muscles but keep the joint in one position. You will probably be involved in a progressive rehabilitation program for four to six months after surgery to ensure the best result from your ACL reconstruction. In the first six weeks following surgery, expect to see the Physical Therapist two to three times a week. If your surgery and rehabilitation go as planned, you may only need to do a home program and see your Physical Therapist every few weeks over the four to six month period.